Rocky slot machine from Playtech is based on the legendary series of films born in 1976 featuring Sylvester Stallone as Rocky Balboa, a rags to riches story of a great fighter. This mobile slot looks great, featuring all the main protagonists from the films of its 5 reels, and also has a jackpot of 1,000x. These are loads of great features and there is also a free spins bonus with 25 free spins up for grabs. To see how hard the game hits, keep reading for the full Rocky slot review below. While it’s a well-known fact that anyone who watches a Rocky movie will temporarily be tempted to join a boxing gym, the reality is that in 99% of cases these best-laid plans don’t come to fruition. So, instead of convincing yourself next time will be different, why not hit the very notion of physical exercise on the head and strap yourself in for 10 rounds with Playtech’s Rocky slot instead? 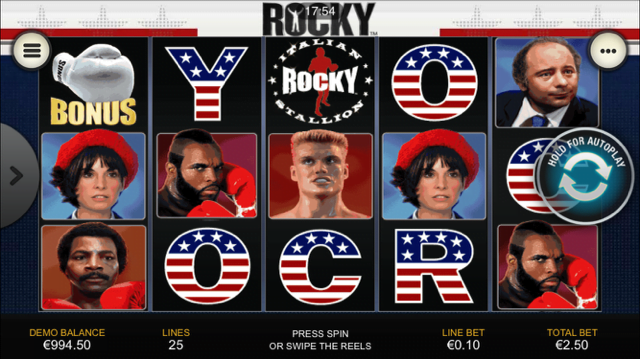 Based on the cult series of boxing films, the Rocky slot machine features all your favourite characters from the titular hero to his three iconic opponents – Apollo Creed, Ivan Drago and Clubber Lang – across its five reels and allows players to choose between one and 25 active paylines for as little as €0.01 per line. The maximum regular jackpot in the game is 1,000x your stake per line for matching five Creed symbols, but there’s also an additional bonus of 5x your bet if you spell R-O-C-K-Y across all five reels. As you’d thoroughly expect from a boxing-themed mobile slots game, the main bonus feature in Rocky pits our hero against one of his three on-screen opponents whenever boxing gloves appear on the first and last reels simultaneously. After choosing a foe, mobile casino players will see a video clip of our hero slugging it out in the ring and win a cash prize for every round that he wins – spoiler alert: Rocky never loses! In addition to this instant cash prize feature, there are also a number of free spins available during the base game. Activated by finding three or more Italian Stallion icons anywhere on the gameboard, players can win 15, 20 or 25 free spins, with each spin being subject to a 2x multiplier. To further sweeten the deal, a number of extra wild symbols are added to the reels during free spins and the feature can even be re-triggered an unlimited number of times to create huge bonus wins. Make no bones about it, the Rocky slot is a true heavyweight. Whether it’s down to the bonus feature, the free spins or just plain nostalgia value, most players will struggle not to be knocked off their feet. Like the Rocky slot review? Check out these as well…..